Thanks, Mr. Mutter, for sharing this with all of us. Your piece brings back memories when I had to tell my staff at The Houston Post on April 15, 2005, that this was the last day the presses would run. Reasons were different but emotion on that day was not. Very sad. Although I had been there two years, there were several who had served for over 40 years. I loved that paper and learned from it as I flailed away with no training on a small paper on the prairie. I hated to see it go. There is never a discussion that maybe the quality of the writing and relevance of the narrative is what put print in jeopardy. investigative reporting, the romantic longing historical journalism, may not be what the culture needs to reclaim democracy and the common good. Enough blaming the internet, suburbs, ADHD, sound bite. when the profession take a harder look. The Daily News closed a year and a half before I graduated J school. Its closing effected the entire Midwest as jobs that might have gone to newly graduated journalists went to those with more experience. Luckily, I left for the west coast where the newspaper market was better and joined Hearst's Herald Examiner… which closed in 1989, though I had by then left for Copley's Santa Monica Outlook… which eventually closed in 1998, but then I was in magazines (all of which still publish). I got my start in journalism while still in college as a part-time editorial assistant to Irv Kupcinet at the Sun-Times, courtesy of feature editor Bob Zonka, who was teaching me newswriting at Columbia College at the time. Some time shortly threafter, Zonka returned from a brief vacation to discover that he'd been replaced. 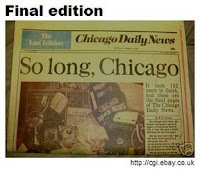 The Sun-Times management couldn't wait until he got back. That was my first taste of the duplicity of the Field regime. 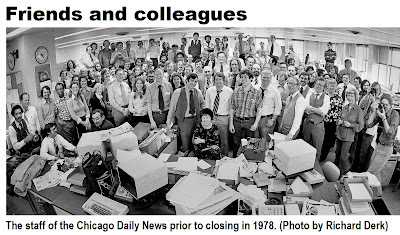 By the time I got back from grad school at Mizzou three years later, the Sun-Times wasn't hiring anyone straight out of school anymore, and City News Bureau had frozen up while I was away, with nobody rotating through the beats anymore or moving to the daily papers. I should have seen the writing on the wall then, because ever since, I've seen a market in decline in Chicago, with jobs constantly lost. The internet was just the final insult. I am also reminded that but a few years later, Marshall Field V told his staff at the Sun-TImes that he would never, ever "sell the Sun-Times to Rupert Murdoch or anyone like him" -- and then proceeded to do exactly that about a month later. And the Sun-Times staff had to hear about it from a Tribune reporter who had been at a meeting of one of the business clubs at the city when Field first mentioned it. I have damned his name ever since, and I feel sorry for those staffers who are left. 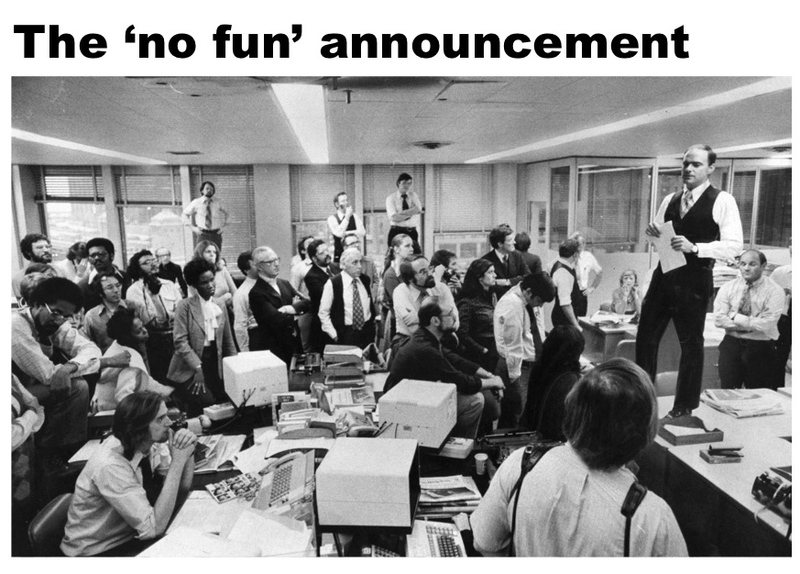 But they're still doing a better job than the Trib, where the managing editor headed an afternoon entertainment handout for commuters before becoming the ME. Seriously.